Sensitivity in the upper hemisphere with respect to an observation site. Insensitivity to signal linear polarisation angle. Suppression of unwanted signal reception from very low elevations (usually ground noise). It represents a basic antenna, currently used on most of our stations. It has an advantage of having a small size and it is thus not difficult to be installed on balcony, terrace, etc. Equally important is its relatively primitive design which allows for an easy construction suitable for beginners. A disadvantage is a low gain and a radiation characteristic that has a sharp zero in zenith (meaning a very bad detection of meteors flying over an observation site, causing, subjectively, a big difference compared to visual observation). SC-QHA Helix is a type of circularly polarised antenna whose parameters can be almost homogenous over the whole hemisphere. The antenna is tuned mainly by a proper phasing of its four powering points. Bolidozor network would make use of a Helix design with a square ground area measuring 2x2m. Such constructions has an advantage compared to a standard self-phase QHA antenna in that it has a narrower receiver bandwidth and greater total efficiency. 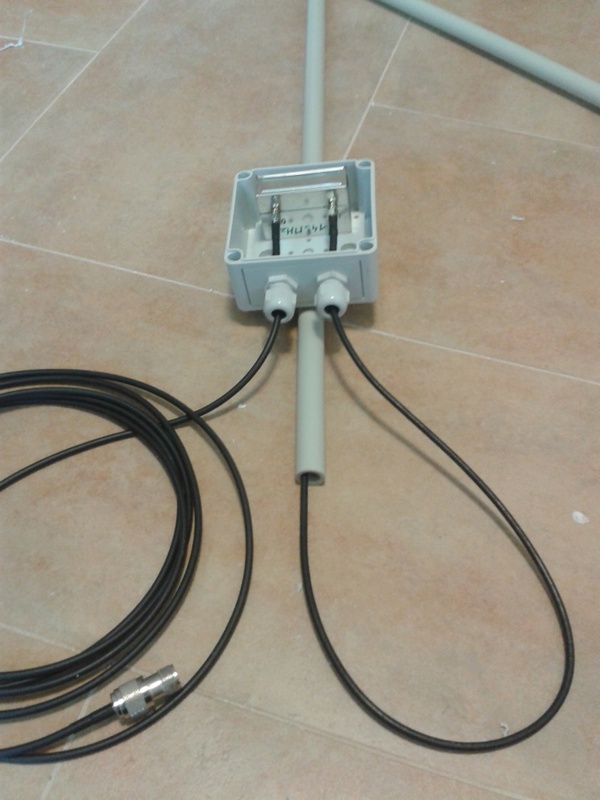 This antenna was designed to improve the gain of the receiving system compared to a currently used GroundPlane antenna. Patch antenna does not have the zero in zenith and has an almost hemispherical radiation characteristics - that is why it is also sensitive to signals from objects flying directly over an observation site. Symmetric shape of its radiation pattern (?? vyzařovací charakteristika) is also suitable for phase antennae fields, where there is necessary to optimise the sensitivity of antennae system for a specific type of observation. 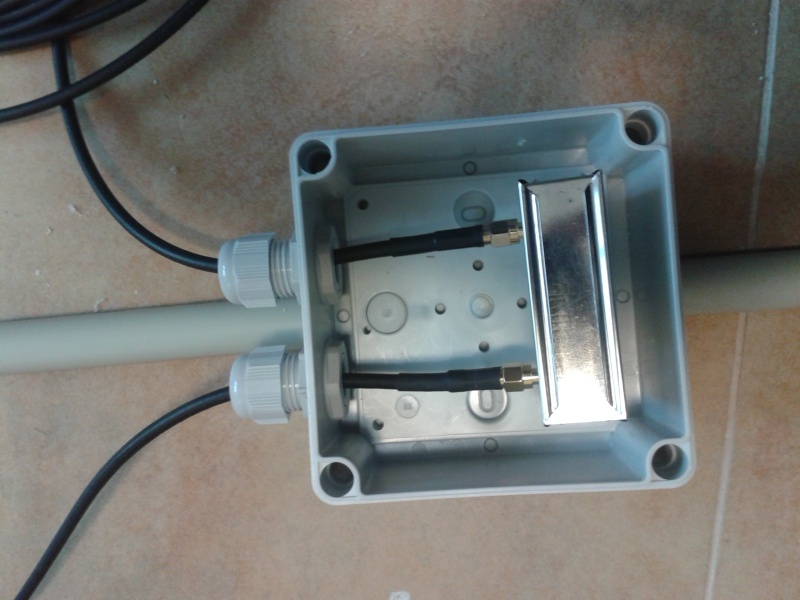 The following photos show the first build functional sample of a new patch antenna. Patch type antennae with a circular polarisation are difficult to manufacture, because for their function, they need a good tuning of the phase shift of two orthogonal linear polarisations - achieved by a deformation and a change in geometrical size of an antenna radiator. Thus it follows that it is easy to detune an antenna by a resonator deformation or a change in dielectric parameters of an environment between a radiator and a reflector. The construction of this type of antenna is therefore apparently overcome by SC-QHA antenna type. An interesting antenna design, that should solve the drawbacks of GP antennas is a so-called eggbeater or an antenna of Turn style type. A pair of crossed dipoles above a conducting plane could also result in interesting experimental solutions as it would be probably possible to integrate an amplifier directly into an antenna. The resulting active antenna would have better noise parameters and reliability compared to design with a separated GP antenna and an LNA. Discone antena has also been tested for receiving the reflected signal. Although it works, it has an disadvantage of wide bandwidth, that causes a penetrations of undesirable signals. A good quality preamplifier is essential due to losses during signal propagation via antenna and due to low intensities of reflected signal. LNA01A is a preamplifier designed for meteor detection in 2m band. Its benefit is mainly in amplification of signal from antenna (thus decreasing the influence of antenna’s lead (?? svod antény) and a noise from receiver). Furthermore it reduces complications connected to signal radiation from receiver’s oscillator. Preamplifier is therefore always installed in an immediate proximity of antenna in a plastic waterproof wiring box.